The founding of the Theosophical Society is uniquely associated with circumstances surrounding a presentation on ancient canons of proportion in the New York apartment of Helena Petrovena Blavatsky and Colonel Henry Olcott. In this lecture, Professor Scott Olsen will demonstrate that to those who know how to approach her, Nature will lift her veil revealing a stunning system of elegant aesthetic delights. The Golden Section appearing at the centre of it all, may well be the foundation of the most beautiful ratio in Nature and the very bond that holds everything together through ratio, resonance and self-similar harmony at all levels. Known to Plato and the initiates of classical Greece, the Golden Section's ubiquitous presence in all things, provides the means for our progressive unfoldment into higher states of consciousness, in what the ancients referred to as initiation into the mysteries. Scott A. Olsen, Ph.D. Professor of Philosophy & Religion at the College of Central Florida, Scott first received international acclaim by successfully decoding the geometric mysteries of Plato. 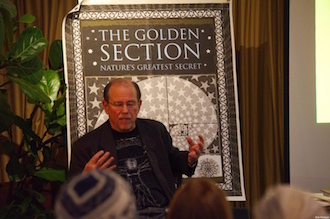 His book, 'The Golden Section: Nature’s Greatest Secret' received rave reviews, and in 2007 was awarded a 1st place for design by the Bookbinders’ Guild of New York. A life-long student of the Ancient Wisdom, he has studied under physicist David Bohm, world religion expert Huston Smith, sacred geometers Keith Critchlow & John Michell, and esotericist Douglas Baker. A member of the Theosophical Society in America, Scott lectures widely on the Perennial Philosophy (in both its ancient and modern forms) with special emphasis on the Divine Proportion and transformative states of consciousness. In 2009 he assisted Alexey Stakhov with his highly acclaimed book, The Mathematics of Harmony: From Euclid to Contemporary Mathematics and Computer Science.